A kind of Yiddish mumblecore. Menashe is the first narrative feature from documentary filmmaker Joshua Z. Weinstein, and yet the film nevertheless approaches its subject from a documentarian’s perspective. 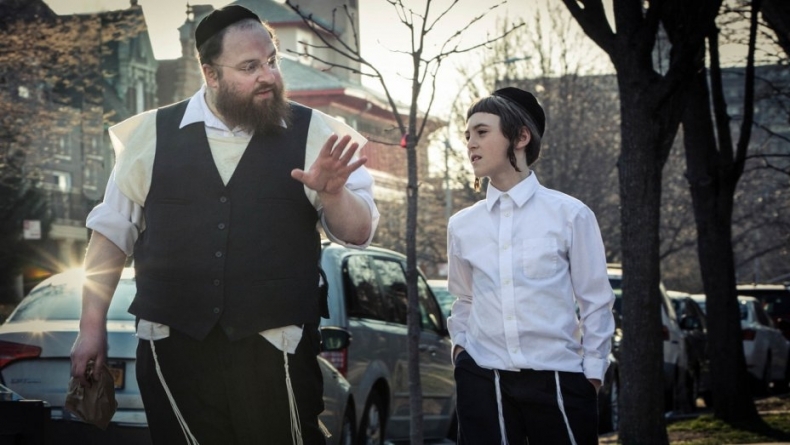 Featuring a largely nonprofessional cast, much of Menashe was actually filmed covertly in the Hasidic neighborhood of Borough Park, Brooklyn. The lead, Menashe Lustig, is a grocery store worker and YouTube personality whose life inspired the film’s plot. While this hyper-realistic style gives Menashe many of its strengths, it also shackles the film with its most significant weaknesses. Menashe’s primary strength rests in Lustig, who has a face that can tell a story all by itself, and even his character’s strangest quirks have a way of coming off as charming. The respectful tone of the filmmaking makes it immediately clear that Menashe’s eccentric characterization isn’t negative commentary on Hasidic Judaism, but rather that he doesn’t entirely fit in with his own community. Most of the plot involves the recently widowed Menashe’s struggle to keep/regain custody of his 10-year-old son, Rieven (Ruben Niborski), who according to Hasidic rules must be raised in a home with a mother present. This means that Rieven is sent to live with Menashe’s brother-in-law and his wife. Nibroski, like Lustig, is a debut actor with such an inherently endearing presence that he seems like an old pro. The two have a quiet and occasionally uneasy chemistry that suits Weinstein’s naturalistic aesthetic. The director does well to keep his explicit analysis of the Hasidic community to a minimum, allowing his camera to speak for itself. And while some of the customs on display will be difficult for mass audiences to identify with, as will the Yiddish dialogue, there is little judgment and the story never takes on any kind of the gross “look, how quaint!” tone as found in many other stories about unique cultures. However, the semi-documentary format also causes Menashe some problems. For starters, there is an uncomfortable voyeuristic element to some of the scenes. Beyond that, however, is that Menashe’s and Rieven’s performances are boxed in by Weinstein’s approach, which amounts to a kind of Yiddish mumblecore. There is an entrancing solemnity to many of the scenes of daily Hasidic life, but that solemnity doesn’t necessarily fit well with the leads. In that sense, Weinstein’s straddling of the line between documentary and narrative film gets in his way. The depth he adds through authenticity is sabotaged by the level to which realism inhibits his main actors. It also cripples some of the film’s comedic and dramatic effects, such as Menashe’s attempts to date and the ways in which his working-class existence clashes with his brother-in-law’s lifestyle. There is also the sense that Weinstein is trying to say something more here, that he’s asking the audience to analyze Menashe and what his string of failures could mean. However, the camera is just too distant and Weinstein’s hands just a bit too far from the material for thoughts about Menashe to be any more than speculation. It’s not as infuriating as some films that leave narrative threads dangling in the wind, but it’s disappointing because, despite dynamic performances, the talented actors simply aren’t given the chance to reach their full potential.